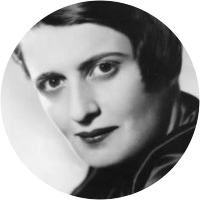 A collection of the best Ayn Rand quotations. Great men can't be ruled. Every loneliness is a pinnacle. All work is an act of philosophy. Words were a lens to focus one's mind. An idea is a light turned on in a man's soul. A house can have integrity, just like a person. The Virtue of Selfishness: A New Concept of Selfishness. Civilization is the process of setting men free from men. No one's happiness but my own is in my power to achieve or to destroy. In all proper relationships there is no sacrifice of anyone to anyone. Power-lust is a weed that grows only in the vacant lots of an abandoned mind. God ... a being whose only definition is that he is beyond man's power to conceive. I'm working to improve my methods, and every hour I save is an hour added to my life. A good quotation must be a complete entity. It must be like a headline—sharp, clear, whole. Do you know the hallmark of the second-rater? It's resentment of another man's achievement. Happiness is that state of consciousness which proceeds from the achievement of one's values. If any part of your uncertainty is a conflict between your heart and your mind—follow your mind. Happiness is that state of consciousness which proceeds from the achievement of one's own values. Money demands that you sell, not your weakness to men's stupidity, but your talent to their reason. The skyline of New York is a monument of a splendor that no pyramids or palaces will ever equal or approach. The people who are not interested in philosophy need it most urgently; they are most helplessly in its power. Throughout the centuries there were people who took first steps down new roads armed with nothing but their own vision. "Mediocrity" does not mean an average intelligence; it means an average intelligence that resents and envies its betters. Professional intellectuals are the voice of a culture and are, therefore, its leaders, its integrators and its bodyguards. Only the man who does not need it, is fit to inherit wealth, the man who would make his fortune no matter where he started. He liked to observe emotions; they were like red lanterns strung along the dark unknown of another's personality, marking vulnerable points. In any compromise between food and poison, it is only death that can win. In any compromise between good and evil, it is only evil that can profit. Every major horror of history was committed in the name of an altruistic motive. Has any act of selfishness ever equaled the carnage perpetrated by disciples of altruism? If a life can have a theme song, and I believe every worthwhile one has, mine is a religion, an obsession, or a mania or all of these expressed in one word: individualism. Man is a being with free will; therefore, each man is potentially good or evil, and it's up to him and only him (through his reasoning mind) to decide which he wants to be. The spread of evil is the symptom of a vacuum. Whenever evil wins, it is only by default: by the moral failure of those who evade the fact that there can be no compromise on basic principles. The passion for gambling comes from a man's belief that he has no control over his life, that he is controlled by fate, and, therefore, he wants to reassure himself that fate or luck is on his side. Money is only a tool. It will take you wherever you wish, but it will not replace you as the driver. It will give you the means for the satisfaction of your desires, but it will not provide you with desires. Rationalization is a cover-up, a process of providing one's emotions with a false identity, of giving them spurious explanations and justifications—in order to hide one's motives, not just from others, but primarily from oneself. — Ayn Rand Philosophy: Who Needs It? The writer who develops a beautiful style, but has nothing to say, represents a kind of arrested esthetic development; he is like a pianist who acquires a brilliant technique by playing finger-exercises, but never gives a concert. There are four characteristics which brand a country unmistakably as a dictatorship: one-party rule—executions without trial or with a mock trial for political offenses—the nationalization or expropriation of private property—and censorship. Do not let the hero in your soul perish, in lonely frustration for the life you deserved, but have never been able to reach. Check your road and the nature of your battle. The world you desired can be won, it exists, it is real, it is possible, it's yours.